iStorage diskAshur PRO² was featured in a roundup of the Top USB drives to keep your data secure on https://www.techradar.com – the largest UK-based consumer technology news and reviews site. Opengear (www.opengear.com), a leading provider of solutions that deliver secure, resilient network access and automation to critical IT infrastructure, today announced its integrated NetOps Automation platform that will offer enterprises a full-featured network automation solution to significantly streamline network and infrastructure operations. Opengear is announced the beta availability of the solution at Cisco Live, Cisco’s annual IT and communications conference, held June 10-14 in Orlando, Florida. As the popularity and adoption of NetOps evolves, its inherent network virtualization carries increased risk to data center infrastructure and heightens the need to correctly provision, configure, remediate, and automate distributed networks. With the NetOps Automation platform, Opengear builds on its industry leadership pioneering cellular-enabled out-of-band access, monitoring, and remediation to now provide secure, automated, and vendor-neutral network provisioning, remote configuration, and orchestration purpose-built for NetOps use cases. Opengear’s Lighthouse 5 centralized management software aggregates an organization’s entire out-of-band infrastructure, enabling local or remote users to quickly and securely access any connected console via an HTTPS web interface or SSH connection. Opengear’s remote management solutions provide Lighthouse 5 with this access, utilizing embedded cellular connectivity within Opengear’s Smart OOB™ and Failover to Cellular™ technologies to reach devices even when the main network connection is down. The first of Opengear’s task-specific NetOps modules – the Secure Provisioning module that allows enterprises to provision infrastructure at remote sites through an automated process and without any need for on-site technicians – is available in beta today and is targeted for general release in September 2018. Other modules will follow. The NetOps Automation platform utilizes a fully open architecture, including a Git-based file repository within Lighthouse 5, Ansible integration to provide orchestration and enable automated IT workflows, a RESTful API, Docker integration, and a Linux software base. With the OM2000 Operations Manager, Opengear is introducing the first appliance specifically designed to address the unique challenges created by the evolution of NetOps practices. The central feature of the OM2000 is a cryptographic TPM chip that ensures security by detecting and preventing tampering with the hardware, firmware, software, configurations, or VPN keys. The OM2000 also allows teams to run applications on the appliance or on Lighthouse 5 using Docker containers, which make it easy to deploy and run applications at the network edge. “The NetOps Automation platform is designed to give enterprises with large networks a clear, reliable, and secure way to achieve full network automation every single time, and avoid the need for experienced network staff at every location” said Marcio Saito, CTO, Opengear. “By combining Lighthouse 5, the OM2000 Operations Manager and our Secure Provisioning NetOps module, along with standard Opengear appliances, businesses can now ship critical hardware to locations with no IT staff or network connectivity. They can then connect to it via the embedded cellular connection, and manage automated provisioning that gets that site up and running with no further intervention required. We believe this will give many more organizations what they need to vastly simplify their network and infrastructure operations. Opengear, a leading provider of solutions that deliver secure, resilient network access and automation to critical IT infrastructure, has announced that Virtual1, a major UK network services wholesaler has selected Opengear’s Smart OOB platform to provide remote console connectivity across its growing UK network. With a network spanning 180 cities and towns across the UK, Virtual1 is fast becoming the UK’s leading Digital Service Provider. Working exclusively for the wholesale markets, Virtual1 operates an advanced platform delivering high capacity, low latency networking which is also privately connected to market-leading UC, SIP and Cloud solutions. Working closely with Flow Communications, a highly regarded Opengear partner; Virtual1 has deployed a resilient OOB architecture that uses secondary DSL circuits and even traditional modems to provide a triple layer of resilient IP based accessibility to key switches, servers and PDUs across its network. The Virtual1 core network comprises over 350 routers and switches deployed nationwide providing service via Gigabit and 10Gb ports passing 7.5M premises, delivering a potential 15Tbps of capability. This infrastructure is supplemented with the 300th recently installed Opengear ACM7000 Remote Site Gateway appliance. With Opengear’s Smart Out of Band Solutions, your customers can remote access to their critical devices any time, anywhere, even when the network goes down. With Opengear’s Lighthouse Centralised Management Software, allows single pane of glass platform that enables engineers to seamlessly connect and manage all devices remotely. Data room monitoring and management has now become universal although matching the requirement to the facility is very dependent on the software and hardware functionality as well as its availability. There is no doubt that standard off the shelf hardware and software is a proven way of keeping down data room costs. The management software controls and monitors the most critical hardware and cabinet security aspects, it views the data room as an interconnected environment controlling and monitoring cabinet level aspects such as physical security, power, cooling, environmental and management services. There is also a high degree of flexibility in both the software and hardware allowing for large or small data rooms as well as future system expansion. 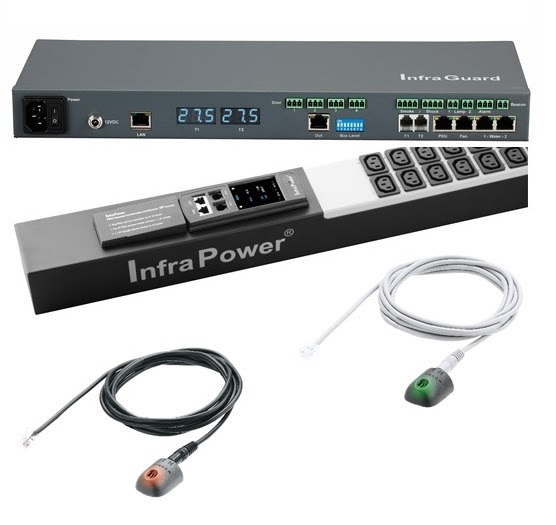 The InfraGuard master box includes two large visual LED temperature monitoring windows. A further two other temperature monitors are also available directly from each PDU (the values from which can be viewed either via the software or on the PDU LCD screen itself) giving a potential of 10 temperature and humidity sensors per cabinet. Opengear ensures uptime in Datacentres, in colocation facilities and remote sites, and out to the very edges of the network. SD-WAN is the application of Software Defined Networking (SDN) to create a smarter, more agile Wide Area Network, able to support the increasingly sophisticated distribution of networking devices across multiple locations and remote sites, whether that’s branch offices, manufacturing locations or retail stores. It provides the flexibility to change the network configuration and logical topology without changing the physical infrastructure, and allows the creation of virtual network groups across sites, independent of where people are geographically located. The New Year is here…what’s in store for MB Technology? MB Technology is coming into its 4th year of trading and we have achieved a 50% year on year growth, as well as bringing on Opengear as a new brand. We have seen our team grow from 3 to 6 people, with a plan to employ another 2 people in 2018. We are adding 2 more brands to our portflio that enhance and complement our existing product offering to our Reseller partners. We are streamlining our IT systems to enable us to offer a better service to our customers. Meet the team…we are here to help you!